CARBONDALE, Ill. — In keeping with their long-time tradition, the College of Agricultural Sciences at Southern Illinois University Carbondale recently recognized alumni, students and faculty members for their service to the college and the community. 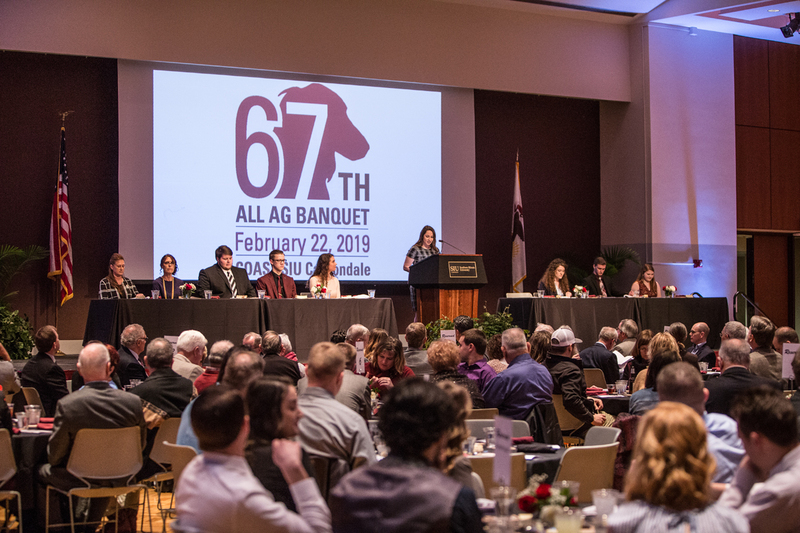 More than 200 students and 150 alumni, donors, legislators and community members attended the 67th annual “All Ag Banquet” on Feb. 22. The evening began with remarks by Chancellor John M. Dunn and Dean Karen Midden, and followed with awards given in honor of several unique achievements. Illinois state Reps.Terri Bryant, R-Murphysboro and Dave Severin. R-Benton, and state Sen. Paul Schimpf, R-Waterloo, joined the festivities to honor the remarkable achievements from those within the college. Three alumni received recognition for their commendable post-graduation work. The Outstanding Alumni Early Career Award, presented to an alumnus who graduated within 10 years, went to Ashlee Spannagel. Spannagel completed her bachelor and master’s degrees in plant, soil science and agriculture systems, with a specialization in agriculture education in 2010 and 2012, respectively. After serving as a high school teacher for three years, she went on to complete a Ph.D. of Education and started her career in higher education. She lives in Iowa with her husband and works as the director of Delabar CTE System. She also serves as the compliance officer for the state’s Regional Office of Education #33 in Monmouth. The Outstanding Alumni Mid-Career Award, presented to an alumnus who graduated 11 to 20 years ago, went to John Lhotka. Lhotka received his bachelor’s and master’s degrees in forestry before going on to complete his doctorate in silviculture at Auburn University. He served as a forester for the U.S. Forest Service Rocky Mountain Research Station, before joining University of Kentucky faculty in 2007, where he built a silvicultural research program related to forest regeneration and growth. Three-degree alumnus Steven Launius received the college’s Lifetime Achievement Award, which recognizes an alum who graduated more than 21 years ago. Launius earned his bachelor’s degree in agricultural education, master’s degree in agribusiness economics and doctorate in educational administration. Launius worked as an agriculture teacher for eight years and he also served as superintendent of several school districts. Over the past 27 years, he has served as a judge for many FFA and agricultural-related activities. In addition to recognizing notable alumni from the college, three students received honor and a $500 scholarship for their excellent work. A selection committee, with representatives from Farm Credit Illinois, the Beta Alpha Alumni Association of Alpha Gamma Rho and the College of Agricultural Sciences department chairs, chose winners. The 2019 Outstanding Sophomore Award went to Paxton Morse, an agriculture systems and education student from Eldorado, Illinois. Morse, the son of Scott and Shelly Morse, previously served as the Illinois State FFA vice president and as the 2017-18 president for Collegiate FFA. He is the National Alpha Tau Alpha president, FarmHouse Fraternity president, executive vice president of the SIU Agbassadors and a member of Collegiate Farm Bureau. The 2019 Outstanding Junior Award went to Kendra Flood, an agricultural systems and education major from Montrose, Illinois. An SIU Chancellor’s Scholar, Flood holds a 4.0 GPA. She is a current Agbassador and serves as secretary for the Ag council. Flood is active in multiple other student organizations and she received the Illinois Farm Bureau Legacy of Leadership Scholarship earlier this year. The 2019 Outstanding Senior Award went to agribusiness economics student Charlotte Metz. Graduating with a minor in marketing, a hospitality and tourism administration certificate and an honors certificate, Metz is on track to complete with a 4.0 GPA. A three-year Agbassador, she is Ag Council vice-president. She is active in several other student organizations and was the college’s nominee for 2018 Lincoln Laureate. . Metz will begin a new position with ADM as a grain merchandiser when she graduates. Sophomores – Cody Suddeth, Tim Weber and Jason Weller. Juniors – Sarah Dintelmann, Sidney Roling and Tess Schaefer. Seniors – Dakota Discepola, Rebecca Harris, Allyson Lintker and Gabriel Wrye. Registered Student Organizations (RSO’s) play an important role in the college and one group is recognized annually for their outstanding participation and campus work. FarmHouse Fraternity earned the award this year. The award sponsor is Farm Credit Illinois. All members of the group perform at least 10 hours of community service each semester and this year participated in a wide variety of campus and student activities. The fraternity excelled beyond philanthropic efforts, with the highest GPA for any fraternity on campus and the second highest for any Greek organization. Kathy Elson, an academic adviser in the college received the Donald M. Elkins Excellence Award. The award originated in 1995, honoring an outstanding staff member who follows the same spirit of commitment, dedication and enthusiasm as the late Elkins. Elson is devoted to the welfare of students and helping them find educational success both in and outside of the classroom. An alumna herself, Elson is adviser for the Pause for Paws RSO and is always willing to help her students find their best educational and career fit. Gary Apgar, a professor and distinguished teacher in animal science, food and nutrition, received the Gary L. Minish Outstanding Advisor-Mentor Award. The student-nominated award recognizes those who advise and mentor students at a personal and impactful level. A long time professor at SIU, Apgar serves as a faculty adviser for many students. Commonly known as the “pig guy,” Apgar manages a research and production experience for students who are looking to work in the swine industry. His dedication to student success leaves a lasting impression on those he works with. At the conclusion of the awards ceremony, The Ag Council hosted a philanthropic fundraiser for Camp Little Giant, a camp at Touch of Nature Environmental Center. The camp is devoted to providing individuals with disabilities to get interact with nature in a safe and exciting manner. The students raised more than $5,100 to purchase a customized swing for individuals to use at the camp. Multiple student organizations banded together to sell raffle tickets for a variety of gift baskets and experiences, along with hosting a live auction to sell larger donated items. Many organizations joined the effort and sponsored items, such as Illinois Farm Bureau, Pitchford Elevator and more.